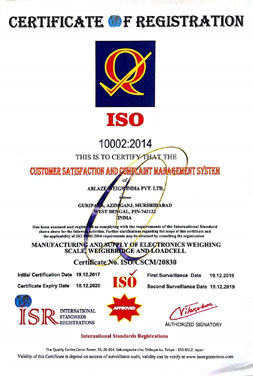 For keeping records of the truck weighments and other data like vehicle number, vehicle type, material, first weight and second Weight, net weight, charges, driver in/out, payment, party name, date time, we provide this device called intelligent terminal or IT. The IT is made rugged to withstand harsh environment and is dedicated for this purpose only. 6 digit high bright external LED display (optional). Support all standard DMP printers. Operating Method: Operator Prompting & Menu Based User Friendly operation. Type of Reports: Date-wise/ Truck-wise. Completed/ In-complete Weighments. Format of Report: vehicle number, vehicle type, material, first weight and second Weight, net weight, charges, driver in/out, payment, party name, date and time. Weighment Slip Details : Weighment Slip contains Serial No., Key No., Truck No., Material/Party Name, Date, Time, Gross/ Tare/ Net Weight etc. DISPLAY : 16x2 big LCD display, 6 digit bright LED display. KEYBOARD : Works with standard IBM PS2 keyboard or USB. REAL TIME CLOCK : For automatic date and time. COMMUNICATION : RS232 port (optional). PRINTER PORT : One Centronics Compatible Printer Port. POWER REQUIREMENT : Works on 230V AC mains. 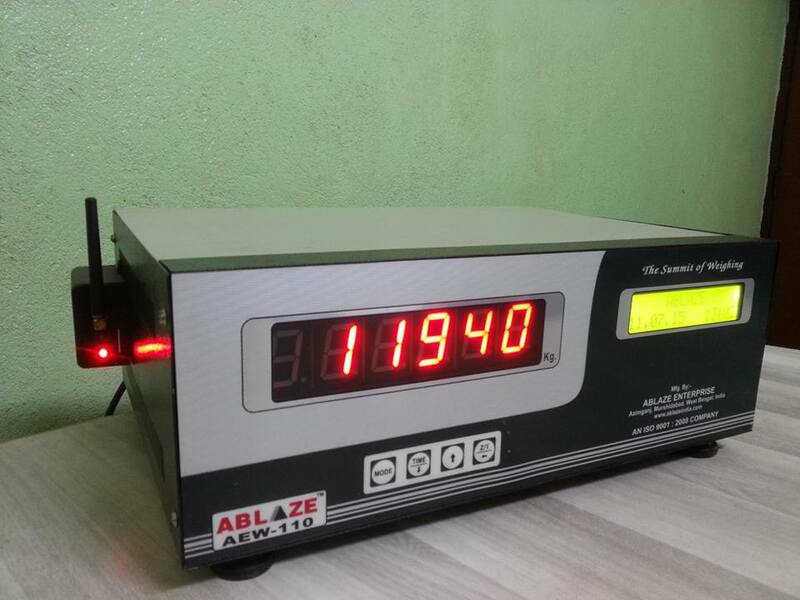 Inbuilt SMPS allows 100-280V operation. CIRCUIT PROTECTION : Through Fuse (1 A). INTERNAL BATTERY LIFE : Allows the data to be stored in the Memory for a period of 30 days without the system is being ON. Operating Temperature Range : 10oC to 55oC. Relative Humidity : Max95% RH (non-condensing). 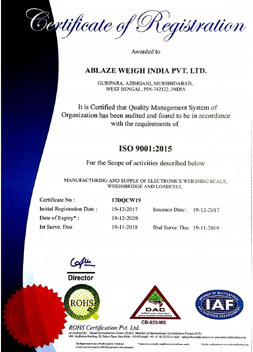 Copyright © 2017-18 by ABLAZE WEIGH INDIA PVT. LTD. All Rights Reserved.